Snapchat Spectacles is a lifestyle yet a great gadget to keep track of all of your everyday rare moments in your timeline. 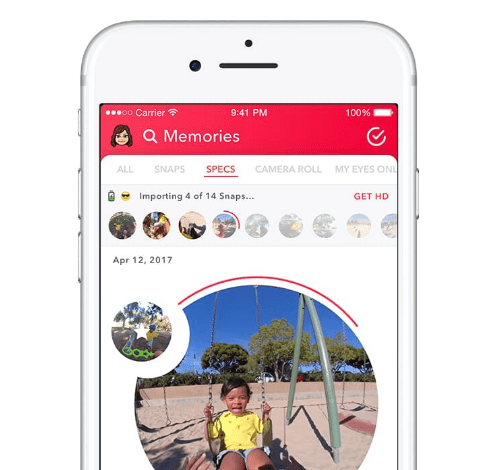 Spectacles is a technology developed by Snapchat Inc for its Memories category in their app. Wear it, spot an impressive moment, press the button and get ready to record a 10‑second video. You can do more with spectacles, be it at a party, adventure, or capture those very rare precious moments that gives you fun and joy while keeping them memories. Spectacles lights show friends you’re Snapping. Snaps automatically save to Memories on Snapchat. Snapchat spectacles cost $129.99 from spectacles with a free delivery in 5 to 10 business days and it includes a charging case and a cable.